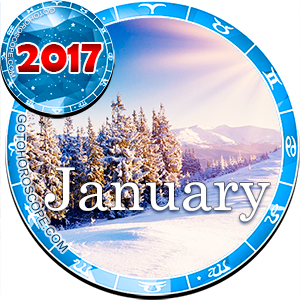 January 2017 Horoscope Aquarius, free Monthly Horoscope for January 2017 and Aquarius Astrology Forecast for the month ahead. In January 2017, people born under the sign of Aquarius can completely count on the most successful combination of circumstances. Despite the fact that the key benefactor of this sign, Mercury, will not take the most outstanding position, Saturn, another celestial helper of Aquarius, will surprise everyone with his extremely powerful and positive energy. In other words, the prevailing trends will be unambiguously positive, but this does not mean that all the benefits will come to you without any effort. These will, however, be honest, legitimate efforts, but you will probably achieve more than you expected, especially with regards to the sphere of feelings and emotions. The work domain will also be successful - higher profits are possible, and you may finally be able to commence with the implementation of the projects you have always dreamed of. This will be a good, productive time, and, most importantly, success will really be on your side. The positions of the stars are explicit in this regard, although they are also downright surprising. You should use the circumstances which have turned up to the fullest extent, in order to lay a foundation for later developments. The more focused you are in your work now, the clearer and more substantial the result you will achieve later. But this is not "work for the future", this is work for concrete, visible results, which will come about now. And don't forget that Mercury, this "celestial merchant", is not on your side now. There is a risk of encountering financial machinations. It is better not to lend any money, and likewise not to get yourself into debt, otherwise you could lose more than you can imagine. 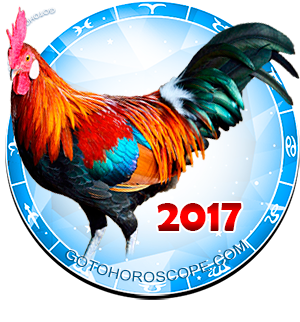 The work domain in January 2017, as already mentioned, could seriously surprise Aquarius, although at certain moments the situation will have a mixed result. First of all, you should take into consideration the fact that now the circumstances will develop overwhelmingly in your favor, but they will require the greatest possible exertion of strength and flawless dynamics. The problem is that one sometimes needs to rest. In other words, physically you just won't manage to take advantage of all the available opportunities. But there is nothing strange about this, because far from every direction will be objectively necessary for your development. In fact, you will have to think and decide which projects to devote your time to, and which to keep in the drawer. You will need to make the decision in the middle of the first ten-day period, in order to free yourself up from superfluous contemplation in future. On the whole, at the end of the month your income should grow substantially, although to a large extent this point concerns those Aquarians who have their own businesses. Those who do not work for themselves can count on significant improvements in the working environment. Pay special attention to your colleagues. The influence of Mercury, which will be negative, but not so negative now, could cooperate with the position of the moon. As a result, by refusing to cooperate, you will deprive yourself of all opportunities. Individualism will result in you not being able to implement even the least of your plans. 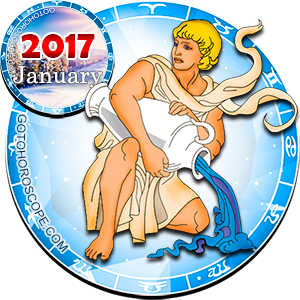 On the "personal front" in January 2017, Aquarius will be fierce, assertive and extremely attractive. Of course, you might not change anything, in which case all the situations will develop normally according to earlier trends. But if you decide to "take the bull by the horns" as they say, there is hardly an obstacle which you will not be able to overcome. On the other hand, at certain moments it is logical to pause and reflect - should you overcome this obstacle? What we mean to say is that in January some of your efforts may be irrational. There is nothing negative about this, as the absence of a result is also a result, but why waste energy where the outcome will not be to your advantage! The stars advise you to examine the situation carefully. Aquarians who have families could significantly improve the atmosphere within their household, and add brightness and warmth to their relationships with loved ones. Pay special attention to the older generation, somebody will probably need sympathy and compassion now. Important note: don't pander to the negative influence of the moon, don't be obsessed with your own problems. By living only in the moment, not paying attention to the future, you will lose yourself. This is especially important for single Aquarians for whom new relationships appear on the horizon at the end of the first or second ten-day period.